For those who don't know, "where did you learn to fly?!" is the oft repeated catchphrase of Skylar, the onboard AI who chimes in with 'helpful' hints and comments during play in Cybermorph. 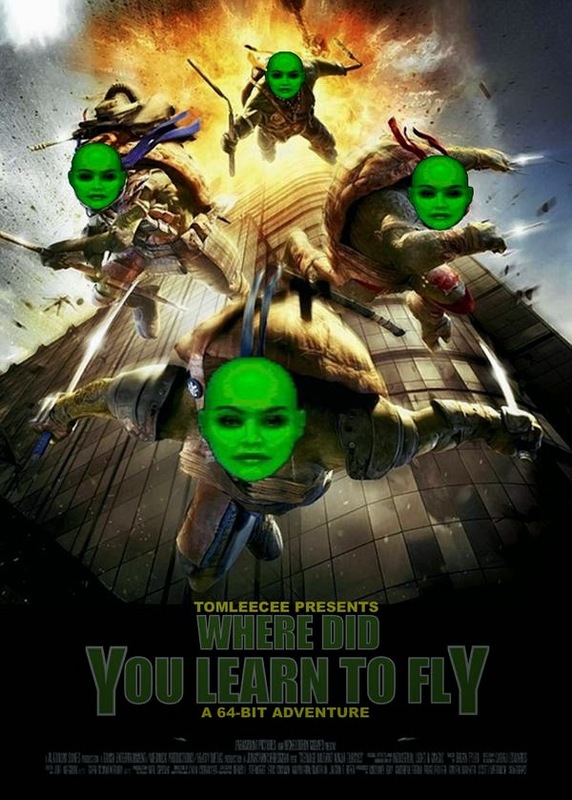 I'm aware this poster for the upcoming Teenage Mutant Ninja Turtles reboot has been pulled as it could be interpreted as being referential of the 9/11 atrocities (it features an exploding skyscraper and the date 11 September at the bottom), but this is just a bit of fun-poking aimed at Cybermorph, and nothing else. The Jaguar CD, whatever people may say about it's aesthetic design, is a great peripheral. 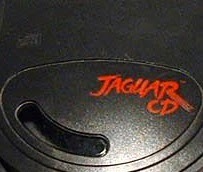 It adds a lot to the Jaguar base system and arguably enhances the console's capabilities much more than the Sega Mega CD did with the Mega Drive. 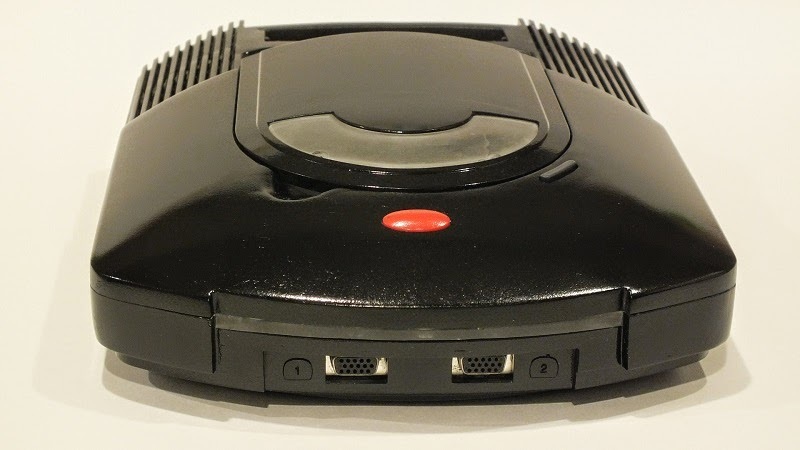 The thing is, due to the tiny user base of the Jaguar at the time of release, the Jaguar CD just didn't find it's way into many homes and is commonly described as a failure of epic proportions. 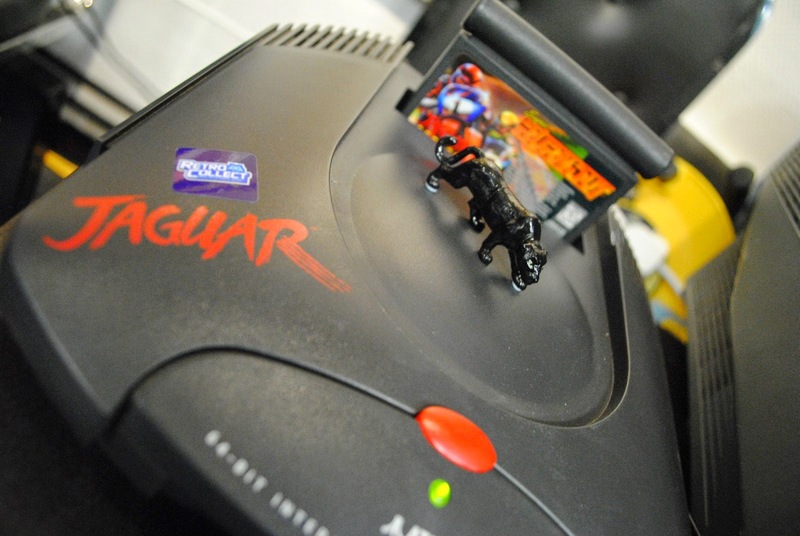 It is well documented that Atari were looking at potentially releasing an 'all in one' Jaguar and Jaguar CD called the JagDuo, which featured a cartridge slot at the rear and a rather eye-catching glossy black CD drive door. If this had been the Jaguar's design from the beginning, I'm pretty confident that Atari could very well have found themselves with a much more successful console on their hands. Sadly the JagDuo (below) was never actually released and the rest is history. Hindsight is such a wonderful thing. To make it I used: 2 Jag cases, 1 CD case, ABS plastic sheets of different thicknesses, epoxy putty, bondo and a bunch of other stuff. The idea is to keep the case as close to the original spec as possible. That meant using ABS plastic for most of the case, and ABS is hell to sand and work with. As I mentioned before somewhere, I also designed everything so it could be molded if I get it fully finished. 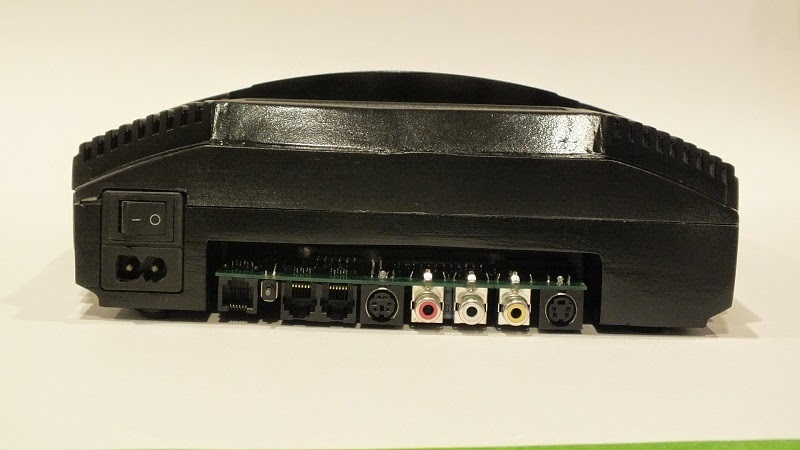 This project is designed to use existing Jag PCB and Jag CD PCB / Drive. So it is a simple case of taking them out of the original case and screwing them into PlayOne. (Nothing is damaged.) The internal PSU plugs into the 9V Jacks on the Jag and CD. This is one reason why the expansion bay is not very high, as the case is below the 9V CD power port. I could have made more room, but that would have required de-soldering the Port which I did not want to do. The front lens also just clips over the LED (which would normally just be Red (States) or (Green Europe.) Even the power button is just lengthened and has no direct attachment to the PCB. It should be noted that the PSU in PlayOne is regulated, and generally outputs 9.2 to 9.4 volts. Furthermore using 110V here in the States, the PSU uses 0.0 to 0.1 watts in standby (Back power switched on, but Jag off) The Jag PSU's here in the states use 3 watts each while idle, so that's 6 watts of power being wasted while the Jag and CD is turned off. Playing Cart games the PSU and Jag use about 7.3 watts, and CD games between 11 and 13 (while CD is spinning.) So the PSU is very efficient, and can save a bit not money in Electric during usage, and when it is not being used. If the back switch is turned off, it uses no power at all. The last weekend was one that involved lots of watching games being played, lots of conversations about games and lots of playing of said games. How so? Well, I was at London Anime & Gaming Con of course! 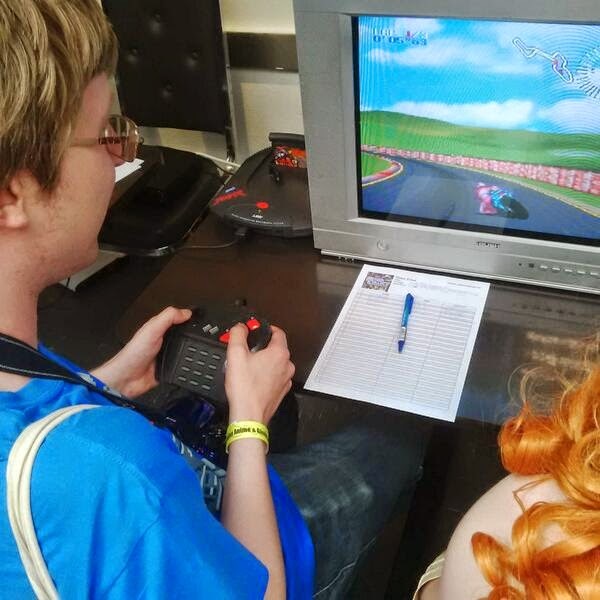 I took along one of my Dreamcasts and one of my Jaguar systems in order to host two of the challenges set up by RetroCollect for visitors to the Con's gaming zone to try their hands at. 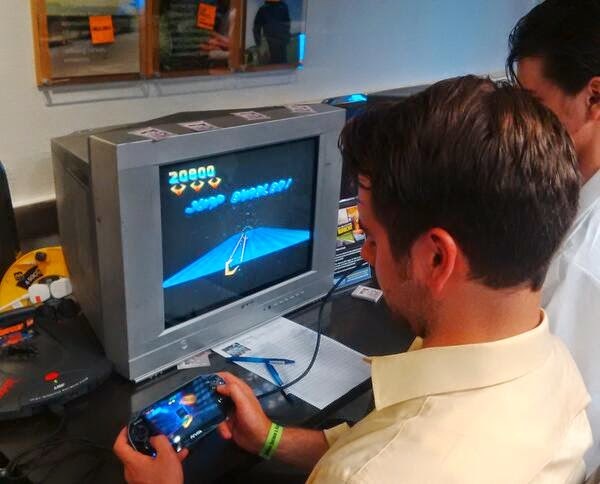 There were other challenges on offer, such as a Gamecube Ikaruga score attack and a Mario Kart 64 fastest time challenge...but what we're here to talk about is the Jag. I decided not to take my Jag CD unit at the last minute just because I figured that the consoles would be on for hours each day and I didn't want to risk overheating the CD unit having it plugged in for such a long period of time. So even though the Jaguar Super Burnout challenge was dubbed the 'Toilet Bowl Challenge' in honour of the Jag CD's lavatory-esque physical properties, I must admit that it was left safe and sound at home. It became apparent from the get-go that the vast majority of people visiting the convention had either never heard of the Jaguar or were familiar, and had overwhelmingly negative impressions of the system. 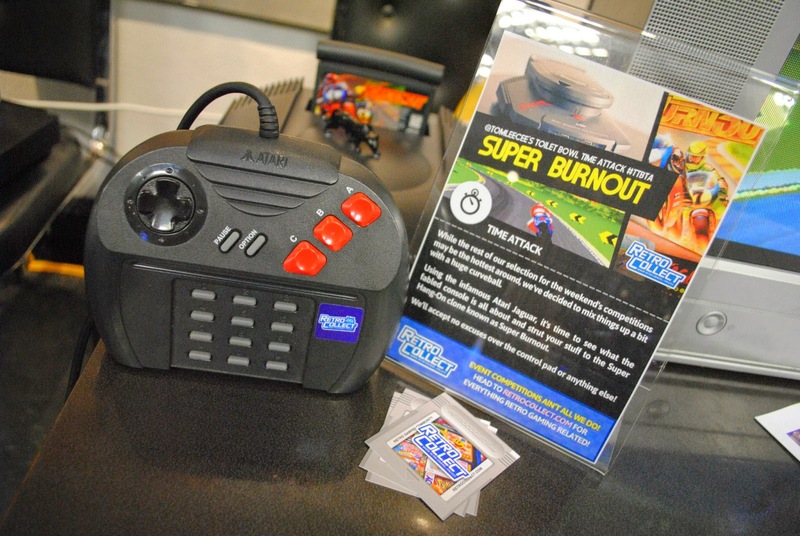 I was there to put those impressions straight...and I had a great tool at my disposal in Super Burnout. 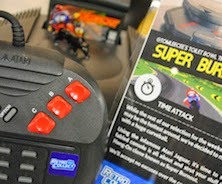 Rather than repulse people, the sublime arcade racer actually enticed a lot of people, and upon playing the game, the undulating terrain and silky smooth framerate got a lot of people interested - indeed, one of the RetroCollect team who didn't own a Jaguar left the event wanting to buy one just for Super Burnout. Other people who visited the retro-gaming sector left with a lot more knowledge of the Jaguar than they entered with courtesy of my good self, and I think Super Burnout was a fine choice of game when trying to exhibit the Jag's impressive sprite-scaling capabilities. The challenge on offer was 3 laps around the Germany circuit on the Super Rabbit bike. 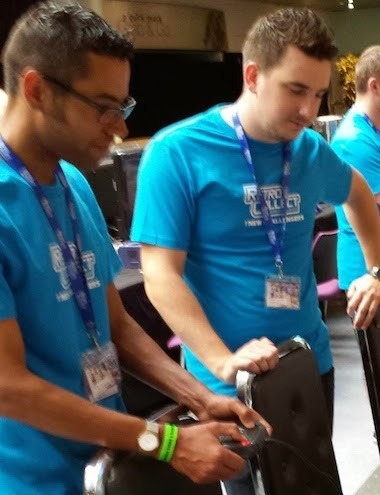 The record lap time for the weekend was set in the first hour by Ian Wall - a gamer who regularly takes part in gaming competitions and is a finalist in the upcoming Classic Gaming Championships due to be held at Play Expo Manchester in October 2014 (it was around 38'43). Other players racked up times in the high 30s and low 40s (my best time was 40'24), but nobody was able to better Ian's time and it still stands on my cart! Several gamers asked to be shown some other Jaguar titles and handily I also had Doom, AvP, Tempest and Power Drive with me so I happily obliged. I also decorated my Jag with it's own mascot - a plastic Jaguar I got out of a Kinder Surprise!